1. Kootenai National Forest: Approximately 60% of all trees slated to be cut under the salvage rider in Montana will come from the Kootenai National Forest. In fact, the Kootenai is scheduled to cut more trees than all the national forests in the Rocky Mountain, Southwestern, and Alaska regions combined. The Kootenai has consistently broken the memorandum of agreement signed by Jack Ward Thomas; many of the sales enter critical habitat for threatened or endangered species, impair water quality, log in roadless areas, and ignore specific Forest Plan standards and guidelines. NORTH FORK BIG CREEK and SOUTH FORK YAAK: These two sales total 57 million board feet and thousands of acres. The sales violate Forest Plan standards for road densities, clear cut size, and jeopardize critical wildlife habitat. 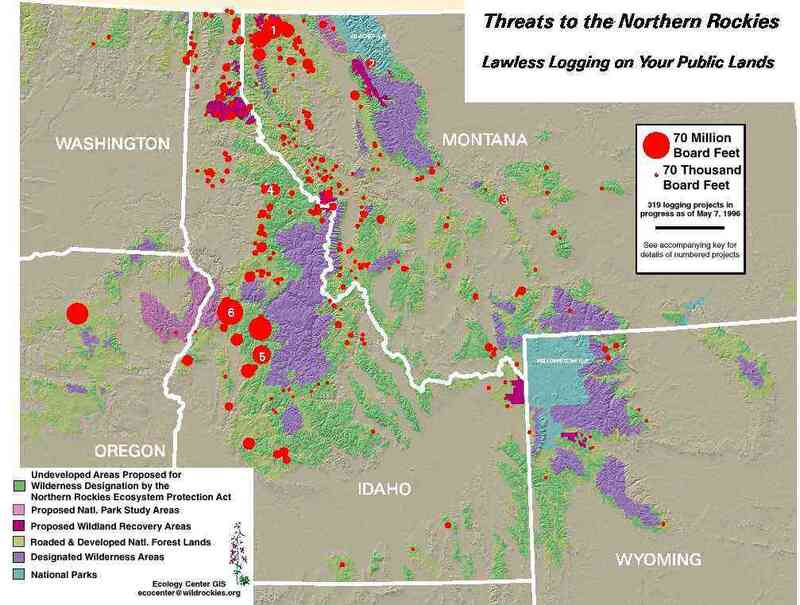 The Kootenai National Forest fabricated grizzly bear habitat security models to justify these salvage sales and is blatantly disregarding its own management standards and guidelines. TREGO TIMBER SALE: In this proposal, the Fortine District identified 612 thousand board feet (mbf) as "salvage." An additional 4.906 million board feet (mmbf) would also be logged to "improve stand health." Canyon Area Salvage: Forest Plan Standards limiting opening size and open road densities exceeded. Cripple Horse Fire Recovery Project: Forest Plan Standards limiting opening size and open road densities were exceeded. Brush Creek Area Salvage: Forest Plan Standards limiting opening size and open road densities were exceeded. Twin Meadows Salvage Forest Plan: Standard limiting opening size was exceeded. Webb Fire Salvage and Resource Rehabilitation Project: Forest Plan Standards limiting opening size and open road densities were exceeded. Barron Salvage Timber Sale: Forest Plan Standards limiting opening size and open road densities were exceeded. Also, in violation of the National Environmental Policy Act, no public review and comment period was allowed. Peace Alexander Salvage Project: Forest Plan Standards limiting opening size and open road densities exceeded. Little Wolf Fire Salvage Timber Sale Includes: Project Specific Amendment to allow exceptions of 1.5 mi./sq. mi. and 2.3 mi./sq. mi. in MA 12, where existing ORD standard is 0.75 mi./sq. mi. Project also violates Forest Plan Standards limiting opening size, including one clearcut of 177 acres (no amendment deemed necessary). Whirling Goats Salvage Timber Sale: Allows ORD in BAA 4-9-2 (which includes checkerboard Plum Creek land) to remain at 1.73 mi./sq.mi. in violation of 0.75 mi./sq.mi. standard; logs in a burned area that already provides insufficient cover to meet the Forest Plan requirement of 600 ft. leave corridor adjacent to a previous clearcut not yet providing hiding cover; reduces core area in violation of July 27, 1995 USFWS incidental take statement. China Basin Salvage Timber Sales: The Decision waives the 0.75 mi./sq.mi. standard to allow roads to remain open in BAA 4-10-1 until IGBC adapts new standards "which should occur within the next year." Also, "Salvage activities will deviate from prescribed Visual Quality Objectives assigned to lands designated as MA 12 (no amendment deemed necessary). And, "Salvage activities will result in openings over 40 acres in size" (no amendment deemed necessary even though the EA states on page 94 that the chosen alternative "would require an exception to Forest Plan standards to exceed opening size"). They claim Forest Plan is not violated due to Regional guidance allowing such cutting unit sizes in response to such "catastrophic" events. Finally, "The Forest Plan standard of 600 feet between 40 acre openings is also exceeded in many areas" (EA at 94). 2. Middle Fork Ecosystem Management Project - Flathead National Forest Located just outside of Glacier National Park this project is touted as a prototype for "ecosystem management", this project, was never identified as a salvage sale. This sale will impact roadless areas, old growth, key grizzly bear and bull trout habitat. The Middle Fork Record of Decision was withdrawn pending appeal prior to passage of the salvage rider 104-19. On October 26, 1995, under direct orders from Hal Salwasser, Regional Forester, the District Ranger re-evaluated the sale and determined that it met the requirements of 104-19. Forest Service silvicultural records for the area indicate there is NO emergency situation. This is not a dead, dying or burned forest this is a green, healthy forest. 3. Atlanta-Wagner Timber Sale - Helena National Forest. Enters three roadless areas and was not a salvage sale until after the salvage rider legislation was signed into law. This sale includes large clearcuts that violate the forest plan standards for wildlife habitat. 4. Fish Bate Timber Sale - Clearwater National Forest. This sale has been offered before but never as a salvage sale until passage of the salvage logging rider. The timber sale cuts old growth cedar and is located in an area that experienced mudslides and road failures due to past Forest Service mismanagement. Now the Forest Service wants to cut more trees and cause additional damage to soil, water, and wildlife habitat. The sale violates the 40 acres opening limitation on clear cut size. The sale will also wipe out entire populations of rare plant species. 5. Thunderbolt Timber Sale - Boise and Payette National Forests. The Thunderbolt timber sale lies within two designated roadless areas and the South Fork of the Salmon River, the most productive chinook spawning watershed in all of Idaho. The Forest Service initially predicted its selected alternative which logged 32 million board feet would sell for 2.8 million dollars. No bids were received, consequently, the volume was reduced to 13 million board feet and sold for 1 million dollars to the Boise Cascade Corporation. The timber contract requires Boise Cascade to log the 13 million board feet and it permits the Corporation to log the remainder of the original sale for a fixed rate of just twenty dollars per thousand board feet. Since 25 percent of timber receipts go to the counties, this scheme leaves the Forest Service with only about $750,000 to spend on its fish habitat projects. The immense costs associated with this project will become the burden of the taxpayers who will pay twice; once for the costs of preparation and execution of the sale and again when some of the best remaining spawning habitat for chinook salmon is destroyed. 6. Main Salmon Post Fire Project - Payette Ntl Forest. This logging operation will destroy the integrity of the French Creek, Patrick Butte and Carey Creek roadless areas, degrade water quality and spawning habitat for chinook salmon.